Never before has managing your money and planning your financial future been as important as it is today – but most people find it hard to know where to start. At AssuredGain, we believe that it starts with discovering what’s really important to you in life – whether it’s your family, your business – or even exciting goals that you have for the future. Whatever ambitions and plans you have, our proven ‘financial life planning’ services are helping people just like you to better manage their day-to-day finances, to grow and protect their wealth and to get on track so that they really can live the life of their dreams. We believe our approach is refreshing, unique and accessible to everyone. We have created a process that has been designed to give vision to your finances and clarity to your dreams. (6) Re-evaluating and revising the plan. One should identify his/her wealth status prior to beginning with your financial planning. This is the foremost crucial step in the financial planning process; you will determine your current financial situation with regard to income, savings, living expenses, debts and commitments. Preparing a list of current asset and debt balances and amounts spent for various items gives you a foundation for financial planning activities. If you are an earning individual, your source of income could be your monthly pay check, and if you are running a part-time business, then the income generated from that business would also add to your income. Once you know how much you get each month, you will know what you can afford to spend and how much you can invest. This is the next crucial step where you must answer What are the financial goals you want to achieve?. To know the answer, Develop a list of financial goals based on your time frame for achieving expected results and your risk-appetite. It can be any requirement like Buying Home, Get out of Debt, Buying Car, Child Education, Child Marriage, Vacation, Retirement, Establish wealth etc… Along with this there must be a very clear timeline associated with the Goal. Something like “I want to buy a Car after 4 years, which will cost 8 Lacs at that time” . The purpose of this financial goals analysis is to differentiate your needs from your wants. Figuring out where you want your money to take you will help you find a reason to start saving and investing. The knowledge of your current financial condition will help a person to decide which needs to choose according to its priority. Always frame your personal / financial goals using */SMART/* Principle (*/S-Specific; M- Measurable; A- Achievable; R- Realistic; T- Time-bound/*) to create effective and efficient result-driven goals. Not all of these categories will apply to every decision situation; however, considering all of the possible alternatives will help you make more effective and satisfying decisions. Next, you need to evaluate possible courses of action, taking into consideration your life situation, personal values, current economic conditions and your financial situation. Keep in mind that every choice has a consequence and every decision closes off alternatives. For example, a decision to invest in stock may mean you cannot take a vacation. A decision to go to school full time may mean you cannot work full time. Opportunity cost is what you give up by making a choice. This cost, commonly referred to as the trade-off of a decision, cannot always be measured in currency (Rupees). 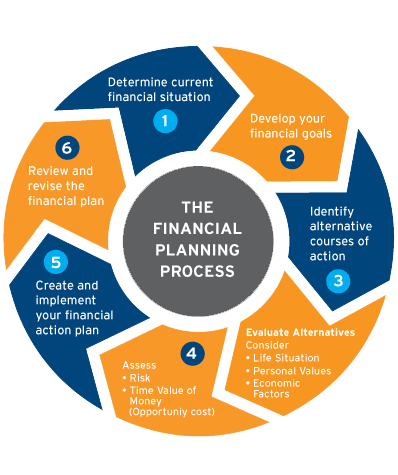 Once you are done with all these steps, you must develop and implement an financial action plan. This requires choosing ways to achieve your goals and objectives based on your risk appetite and time frame. next in priority will come into focus. Once the plan has been implemented, you should review your financial plan from time to time to evaluate how it is working for you. Financial planning is a dynamic process that does not end when you take a particular action. You will need to regularly assess your financial decisions based on changing personal, social, and economic factors. Most investments are long-term, so you can most likely anticipate having annual reviews. Of course, if your life changes through job change or loss, marriage, divorce, disability or another unforeseen circumstance, you should revise your plan as soon as possible and rework any changes necessary to suit your new situation. So, regularly reviewing your financial plan will help you make priority adjustments that will bring your financial goals and activities in line with your current life situation. Our fee structure for comprehensive financial planning has been derived with our experience that we have gained while working with more than 100 families on their financial plans. The fee is drawn as per financial complexities of different people – for example Financial Life of a businessman is much more mufti-facet than that of a Salaried Person. Hence, his plan would require more effort & time, so his fees will be on a higher side in comparison to a salaried person. We offer a free financial review and are happy to have an initial meeting without any obligations. This allows you to ensure you are comfortable working with us before deciding to engage our services. All our recommendations and also our charges will be confirmed in writing. You can call Narendar Kumar at 9962439282. Together, we begin to explore your financial planning needs. If we think we may be able to help you, we’ll schedule a complimentary in-person consultation to evaluate your needs in more detail and determine what AssuredGain can do for you.